Investment Energy Solutions, Inc. - Residential Foam Insulation - Icynene® is an Air Barrier Association of America certified insulation system that provides a protective air barrier ensuring a healthier, quieter and more energy efficient structure. Energy efficiency comes from a home that is sealed from air leakage which helps stabilize the interior temperature with less strain on heating and cooling equipment. This means less energy is used, saving you money and keeping you more comfortable. 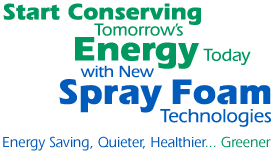 Using spray foam instead of conventional insulation can give you an energy savings of up to 50%. Now that’s green. Quieter interiors result from an air barrier that expands conforming to fill the shape walls, floors, ceilings and basements. Using spray foam insulation like Icynene® and InsulStar® help keep outside noise out and even reduces unwanted noises between rooms and floors. Healthier homes prevent allergens, dust and mold spores from entering. Spray foam insulation combined with proper ventilation will really improve the air quality you breathe inside. And a closed cell insulation like WallTite® will provide an additional vapor barrier to inhibit mold, mildew and bacterial growth. Greener homes come from smarter building practices and our clients live better because of that. Whether you are remodeling an attic, adding a room or building your dream home we can help you save in the future. Click here to review our Spray Foam Products.